A Russian defense official’s announcement that India will indeed go forward with its planned purchase of the S-400s by the end of the year was reported on by RT and other media outlets as the South Asian nation “defying” the US’ CAATSA sanctions threats over this acquisition, though the reality is much more nuanced because New Delhi is also partially giving in to American pressure. Prima facie, it looks like the country is thumbing its nose at the US by going forward with this deal and risking the wrath of Trump’s infamous sanctions, but it can actually evade that punishment if it abides by at least one of two clauses in the recently passed National Defense Authorization Act of 2019. India’s share of Russian armaments has been on a downward trajectory over the past couple of years amid heightened competition from the US and “Israel” in this market, which is occurring in spite of increased weapons purchases simply due to the fact that the country is the world’s largest buyer of military equipment, so it already satisfies the first criterion. The second, meanwhile, is achieved by India’s designation as the US’ first-ever and thus far only “Major Defense Partner” and the publicly acknowledged100-year-long military-strategy partnership that the two sides are engaged in all across the Afro-Bengal Ocean and beyond. 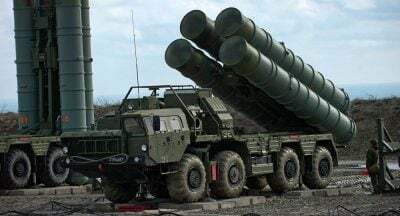 Altogether, it’s clear that India is more than eligible for a CAATSA sanctions waiver for its purchase of Russia’s S-400s. The US would of course prefer that India didn’t go through with this deal, but its global power isn’t absolute like it briefly was immediately after the end of the Old Cold War, and it recognizes the tactical brilliance of sometimes “compromising” with its “Lead From Behind” partners such as India in order to keep them within its unipolar orbit. Applying too much pressure on New Delhi at this crucial juncture by sanctioning it for buying a single weapons system would have recklessly imperiled the very successful years-long effort that the US has made in swaying India over to its strategic side in the New Cold War and drive it closer into Russia and China’s multipolar embrace, hence why it sought to cut a deal with it instead. In fact, it actually serves the US’ grand strategic interests much more to grant India a sanctions waiver for its S-400 purchase than to impose economic restrictions against it for this because Washington will probably succeed in getting New Delhi to continue reducing its share of Russian armaments and therefore remain committed to its century-long partnership with America. Reacting too forcefully against it for the simple sake of “principle” could have been counterproductive because India indicated that it wouldn’t reconsider this deal due to what it hinted as being its policy of so-called “multi-alignment” and need to “balance” between Russia, the US, and also China (the latter of which is one of the reasons why it wants the S-400s in the first place). For these reasons, the US “allowed” India to make a public spectacle of reframing its purchase of the S-400s as “defying” America so long as it quietly continues working with Washington and reduces its share of military equipment from Moscow in order to receive a CAATSA sanctions waiver for this acquisition, both of which are veritably in the grand strategic interests of the US and therefore make it so that India is partially obeying the unipolar hegemon much more than going against it. Featured image is from Sputnik/ Sergey Malgavko.